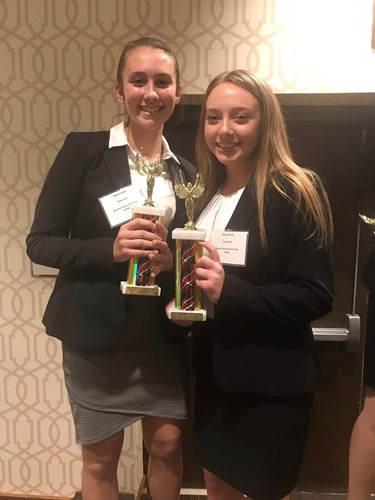 Bethel Park High School students earned 31 awards at the 2018 PA DECA District III Career Development Conference, including 13 First Place, 14 Second Place and 4 Third Place Awards. Earning First Place Awards were seniors Zach Lucido (Sports and Entertainment Marketing), Ciara Roach (Accounting), and Lexi Schanck and junior Brian Torles (Entrepreneurship Team); juniors Hunter Dorfner (Food Marketing), Markus McKitrick (Principles of Finance), Caleb Shook (Human Resources Management), and Jenna Chernicky and Sarah Gilliam (Financial Analysis Team). Also earning First Place Awards were sophomores Christian McClaine (Restaurant and Food Services Management) and Leigha Piazzi (Marketing Communications) as well as freshmen Anastacia Antonucci (Principles of Finance), Kate Sullivan (Hotel and Lodging Management), Swechya Baral and Isabel Burke (Marketing Management Team), and Abby Griffith and Brooke Veith (Buying and Merchandising Team). Earning Second Place Awards were seniors Connor Price (Apparel and Accessories Marketing) and Daniel Sounik (Personal Financial Literacy); juniors Logan Kramer (Entrepreneurship), Jacob Marzina (Accounting), Mark Vighetti (Business Services Marketing); sophomores Josie Gorges (Hotel and Lodging Management), Zach Haddox (Automotive Services Marketing), Lexi Seese (Logistics); and freshmen Jaden Goodman (Principles of Finance), Carter Mastovich (Marketing Communications), Camden Wade (Restaurant and Food Service Management), Taylor Arnoni and Anayah Hunter (Business Law and Ethics Team), Abby Quickel and Sandra Soltes (Sports and Entertainment Team), and Joe Thimons and Dolan Waldo (Financial Analysis Team). Earning Third Place Awards were juniors Joey Bova (Accounting), Nathan Marzina (Entrepreneurship) and Jake Pauley (Hotel and Lodging Management) as well as sophomore Weeam Boumaza (Human Resources Management). All of these students are now qualified to compete in the PA DECA Career Development Conference, to be held in Hershey, PA in February. Senior Lexi Schanck presided over the District Conference as the 2018-2019 PA DECA District III Representative, and junior Mark Vighetti was elected to serve as the 2019-2020 PA DECA District III Representative. The students were prepared for this competition by Bethel Park High School Marketing Teachers Emily Smoller and Maria Christenson. Please click here to see some photos from the District Competition. Good luck at States!